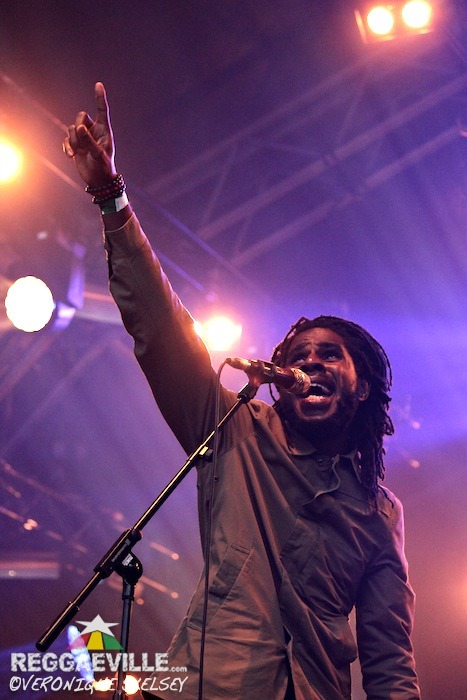 In 2013, for his London debut, Chronixx packed out the Scala in King’s Cross to danger levels. In 2014, he rammed Rodigan’s Ram Jam at Electric Brixton. For 2015, two weeks after a landmark appearance on Glastonbury’s Pyramid Stage, his third excursion brought his Reparation Tour beyond reggae’s heartlands to the Summer Series of concerts at Somerset House. Somerset House was built on the site of Tudor palace – a residence of Elizabeth I before she became queen. So, while some visitors to its open air courtyard were there, to quote series sponsor American Express, to “enjoy the best beats in the city” in a genteel venue; many were waiting to hear Chronixx sing his rebuke to Elizabethan imperialism, Capture Land, in the very belly of the beast. Despite selling out weeks in advance with a 3000+ gate, this was the first less-than-heaving London Chronixx gig. Somerset’s strict policy on capacity left plenty of room around the margins (where the sound was a little unclear but it wasn’t hard to get into the centre if you tried). Heavy rainfall prior to doors opening thankfully subsided as the music began. Support act Dre Island’s Marley-ish vocals and sedentary roots-gospel balladry were a sufficiently similar yet suitably different start. 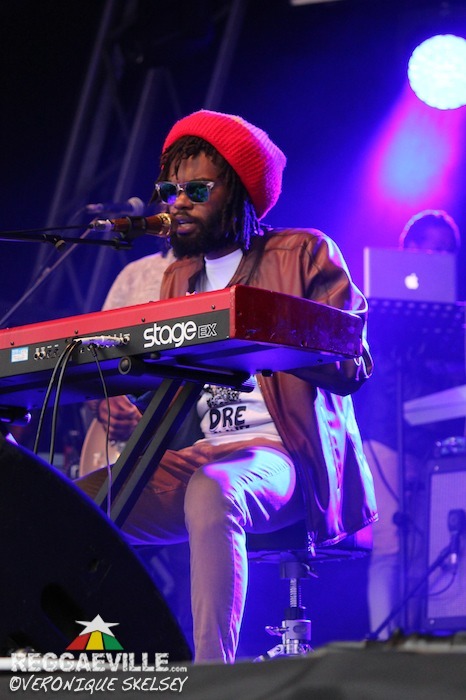 Backed by Chronixx’ Zincfence Redemption band he eventually stood up from his keyboard to close with the propulsive Uptown Downtown (on Winta James’ Militancy rhythm). It was a shame he didn’t share his Rodigan exclusive over the Sound Dimensions Babyface premiered at SummerJam. Even Chronixx might have had a tough time following that. Great fun though it was, Chronixx’ cutdown Glastonbury set could have been sliced differently for a rock festival (there was a slight energy lull during soft songs They Don't Know and Ain’t No Giving In). In London, before a reggae crowd, each section of the full repertoire had its place. And where at Worthy Farm, Chronixx’ Rasta greetings were applauded respectfully from a distance, here they were cheered with familiarity. “Jamaican People!” shouted Chronixx prior to a rapturously welcomed Smile Jamaica. But it all felt like it was building to one song, one moment, yet to arrive. "We as singers and players of instruments can almost be considered the voice of the people" said Chronixx in his delicate, regal voice," And if we don't speak what's on the minds of the people we fail. We are Rastafari children. And we bun colonialism nonstop". This was the introduction to Capture Land - the most devastatingly concise critique of colonial racism committed to a reggae beat since the 70s. The line "here comes the thiefing queen from England" got an even bigger cheer than at the Electric. As red, gold and green flags waved, sections of the audience fell silent. They rejoined the choir for Here Comes Trouble which segued into Ini Kamoze’s World A Music and a Protoje-free Who Knows. And there were further historic firsts for the premises. The dancehall segment saw the night sky illuminated by lighters during Clean Like A Whistle, and built into a lengthy freestyle on Odd Ras. (“We the first Jamaicans to keep dance in Somerset House”). “Normally we ask the people if you love reggae music. But I’m not going to ask you that any more. I give you certificate 100% of reggae” said Chronixx when he and the band returned for an encore of Tenement Yard by Jacob Miller with Inner Circle. “But if you know reggae you will know this bass line”. Chronixx’ performance at the Electric was among his best. But the venue and atmosphere made this one a piece of reggae history whose significance will be known for years to come.